Be it summers or winters, everyone wants to look put together. While the winter season has its benefits when it comes to makeup and clothing, it can, in fact, be harsh on your hair. We're talking dryness, static, frizz, and general lack of that luscious, smooth, shiny hair. One may think, the winter effects on the hair are temporary and are restored as the weather passes. But more often than not, the exposure due to the harsh cold elements zap our hair out of its moisture, causing your dull and weak hair more susceptible to long-lasting damage. Not only are your precious hair strands at risk of breakage due to the dry, cold weather, but scalp dryness, dandruff, can really exacerbate its ugly effects during these drier months. However, these are all problems that can be avoided with ease as long as you have the right hair care routine for winter. And it needn't be expensive even. What helps dry hair in winter? Hydration begins from within. A dehydrated body cannot maintain a healthy and hydrated scalp. Just like all your organs, your hair needs hydration. During winters, sweat evaporates more rapidly in the cold, dry air, and that can result in dehydration. Without the sweat, we’re tricked into thinking we aren’t losing fluids as rapidly as during a hot, summer day. Cooler temperature can also reduce the body’s thirst response. All of this can easily lead to a dehydrated, which in turn worsens the condition of your hair. Drinking enough water is the key to avoiding dehydration. At least 8-10 glasses a day is recommended. Along with hydration, a nutrient-rich diet will strengthen your locks from roots to tips. We very well understand the importance of keeping our hair moisturized and relaxed during winters. Dry hair can very quickly lead to an itchy scalp and dandruff. Which in the worst case, may cause hair to fall. There's no better time to invest in these magical natural oils such as Shea butter, Olive oil, Coconut oil, Babassu oil, Avocado oil. Take any of these oils and massage them into your scalp. Let it stay in your hair for 30 minutes. And finally, rinse it out with shampoo and conditioner. Another way is to take a couple of tablespoons of olive or coconut oil and a teaspoon of lemon juice. Heat the oil for a couple of seconds until it is warm and then mix it with the lemon juice. Massage the oil into your scalp and leave it in for 20-30 minutes. Rinse it out with shampoo and condition. Using a deep conditioner and a leave-in treatment is the easiest way to restore your hair's lustre. A deep conditioning hair mask of warm coconut oil left overnight or mashed bananas, not only help reverse the effects of dryness, but are an excellent preventative measure to ensure that your hair is protected and at an optimal level of health, year round. So don't be afraid to double up on that deep conditioner or homemade hair mask on your next wash.
Blow drying your hair every time after a head wash may seem like a tedious job. But it's absolutely never okay to head out with wet hair, however short on time you may be. Cold hair expands the hair shaft, making the hair more prone to breakage. Another thing you keep in mind is to dry your hair on a warm to cold setting, instead of a hot temperature setting from a distance of at least 15 cms. If at all you’re unable to completely dry your hair before stepping out, ensure to tuck it underneath your scarf or a hat in order to protect them. How can I nourish my hair in winter? Co-washing is a great way to gently cleanse relaxed hair without stripping your hair off moisture or nutrients. Co-washing can be done with a rinse out conditioner or cleansing cream with less or no shampoo. Regular oiling before head washes and weekly leave-in oil masks ensure your hair’s health all winter long. Mix one ripened – soft – banana, one tablespoon of honey, one tablespoon of olive oil, and a few drops of lavender(optional) essential oil in a large bowl, then apply from roots to tips, massaging your scalp. Mix 2 to 4 tablespoons coconut oil with 1 tablespoon honey. Blend ingredients and apply in small sections to clean, damp hair. Add 1/4 cup apple cider vinegar to Juice from one whole lemon and 1 tablespoon honey. and apply in small sections to clean, damp hair. Whisk or blend ingredients, then work into clean, damp hair. Following the hair mask application, cover your hair with a shower cap for 30 to 60 minutes. Shampoo out, and condition. Sit back and treat your hair with the well deserved moisturizing this weekend. 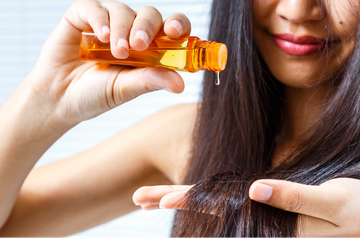 If you find that your hair is still too dry during the winter even with weekly treatments, you may want to go the extra mile and hydrate your hair overnight with a hair oil or serum. However long or short hair you have, winter weather can make the ends of your hair dry and brittle leading your hair more prone to splitting. Regular trims will keep your hair in good condition and reduce the chance of split ends. And hey, a little pampering at the salon every once in a while didn't hurt anybody! It might be tempting in the winters to turn the water temperature up and bathe in lava, as soothing as it may be, it can majorly harm your delicate hair. Try to avoid washing your hair in very hot water - use warm or cool water to avoid damage. Hot water can dry out your hair and damage the delicate skin on your scalp, which may be extra sensitive during the winter. A dry scalp can fasten up the growth of dandruff even. Frizz is a direct result of dry hair. Dry hair soaks up moisture in the air causing your strands to frizz. Mix 1 egg, 2 tablespoons mayonnaise,1 tablespoon olive oil and 1 tablespoon honey. Combine ingredients and blend. Apply in small sections to clean, damp hair. Cover hair with a shower cap for 30 to 60 minutes. Shampoo and condition as usual. Static hair: one of the most annoying side effects of winter. Don't let static undo your pretty’ do. Control static by ditching the plastic com for a wooden one as wood doesn’t conduct electricity. For tamed tresses in seconds try this DIY fresh smelling mist. Mix 8 oz water to 1 tsp to liquid fabric softener. Add 1 tsp conditioner to the mix. Pour liquids in a small spray bottle and shake. Mix a light coating of the mixture on to a brush and comb it through wet or dry hair. A quick fix for static hair is to apply a small amount of water to the hands and smoothing it over your hair as it neutralises the static charge. Spraying hairspray on to your hair is also a quick method to fix static hair. Brisk weather can dry out your hair quickly. Invest in a satin lined hat or a silk scarf. Wrap your hair in a silk scarf before putting on your favourite cozy hat. It will protect your hair from frizz and static. No more crazy hat hair. Taking your beauty sleep on a silk pillow is also something you can do for smooth and soft hair. Opt for styles where your ends aren’t exposed i.e. buns, updo’s, weaves, braids etc. Doing this will not only help keep the hair protected and retain its moisture but also will keep it away from rough winter fabrics. Also, a new signature hairstyle for winters can be a good change. Avoid too frequent hair washing. Avoid heat styling too often. Don’t leave home with wet hair. Avoid rubbing your hair dry with towels as it causes friction between your strands which may lead to their breakage. Avoid extreme hot temperature settings while blow drying. Avoid head washes with hot water. Avoid exposing ends of hair in extremely cold temperatures. Avoid harsh shampoos and hair products. Avoid brushing your hair roughly. Avoid bleaching hair with harsh chemicals. Instead, go darker for the fall and the winter. Avoid very close contact with room heaters. Take care of your hair ladies! As your hair is your best accessory.